These beautiful wild visitors can be deterred easily. The typical wild rabbits in the San Francisco Bay Area are jackrabbits (large hares, 6-9 pounds with long legs, large furry feet and very long ears with black tips), cottontails (about 15 inches long, brownish and black fur, and a large white tail), and brush rabbits (slightly smaller than cottontails—about 13 inches long, sooty colored fur, shorter rounded ears, bluish belly, and small, narrow, white tails). Rabbits of other colors and types could be domestic rabbits that were set free or strayed. Rabbits are supremely efficient recyclers. The grasses that they eat are difficult to digest and thus they process their food twice. The soft black pellets that they first produce are consumed a second time, resulting in final small, hard pellets from which all nutrients have been extracted. Rabbits shelter in abandoned burrows dug by burrowing animals. They forage at dawn and dusk along the edges of fields and woods. Their excellent vision and hearing are needed to protect them from their many predators, including humans. Fencing is an effective strategy. 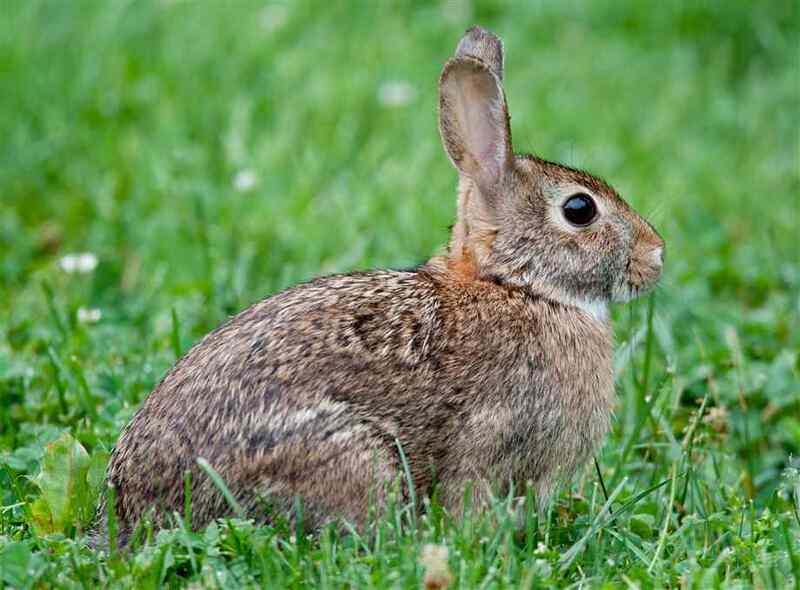 Rabbits are not good climbers or burrowers so a 2-foot high sturdy fence of 1-inch wire discourages them. If you want to discourage burrowing animals as well, simply bury 1 foot of a 3-foot high fence underground, exposing 2 feet above ground to deter rabbits. If you already have a deer fence around the area you want to protect you can add 2 feet high 1-inch hardware cloth to the lower part of the deer fence. If you use 3-foot wide hardware cloth you can bury 1 foot of it below the ground and secure the remaining 2 feet of hardware cloth to the deer fence above ground. Ready-made movable fence panels 2’ high x 8’ wide framed in wood are attractive and effective barriers to rabbits. They can be set up at the first planting, then taken down and stored when they are not needed. The panels must be firmly staked to the ground to prevent rabbits from squeezing under them. Protect individual trees and shrubs by wrapping 1⁄2-inch wire mesh around the trunk. Keep lawns around gardens and orchards mowed and brush cleared away. Rabbits will avoid areas with little cover. Place one-liter soda bottles and plastic jugs with bottoms cut off over young plants. If rabbits are eating your tulip bulbs, place cut rosebush branches above the place where bulbs are planted. If the plants you wish to protect are ornamental and are not grown for human consumption, a bitter repellent spray might deter rabbits. The repellent should taste bad to rabbits but not cause them harm. Read the list of ingredients and instructions carefully. Rabbits are sensitive to odors. They are repelled by plants sprayed with lavender or the following homemade mixture: a cup of chopped fresh mint leaves pureed in a blender with a head of garlic and a little water. Other odorous repellents worth trying are shavings of Irish Spring soap scattered around the base of plants and a sprinkling of dried sulfur around the edges of the garden.